A transmission or gearbox provides speed and torque conversions from a rotating power source to another device using gear ratios. The most common use is in motor vehicles, where the transmission adapts the output of the internal combustion engine to the drive wheels. Such engines need to operate at a relatively high rotational speed, which is inappropriate for starting, stopping, and slower travel. The transmission reduces the higher engine speed to the slower wheel speed, increasing torque in the process. Transmissions are also used on pedal bicycles, fixed machines, and anywhere else rotational speed and torque needs to be adapted. Often, a transmission will have multiple gear ratios (or simply "gears"), with the ability to switch between them as speed varies. This switching may be done manually (by the operator), or automatically. Directional (forward and reverse) control may also be provided. Single-ratio transmissions also exist, which simply change the speed and torque (and sometimes direction) of motor output. In motor vehicle applications, the transmission will generally be connected to the crankshaft of the engine. The output of the transmission is transmitted via driveshaft to one or more differentials, which in turn drive the wheels. While a differential may also provide gear reduction, its primary purpose is to change the direction of rotation. Conventional gear/belt transmissions are not the only mechanism for speed/torque adaptation. Alternative mechanisms include torque converters and power transformation (e.g., diesel-electric transmission, hydraulic drive system, etc.). Hybrid configurations also exist. Early transmissions included the right-angle drives and other gearing in windmills, horse-powered devices, and steam engines, in support of pumping, mill, and hoist. Most modern gearboxes are used to increase torque while reducing the speed of a prime mover output shaft (e.g. a motor crankshaft). This means that the output shaft of a gearbox will rotate at slower rate than the input shaft, and this reduction in speed will produce a mechanical advantage, causing an increase in torque. A gearbox can be setup to do the opposite and provide an increase in shaft speed with a reduction of torque. Some of the simplest gearboxes merely change the physical direction in which power is transmitted. Many typical automobile transmissions include the ability to select one of several different gear ratios. In this case, most of the gear ratios (often simply called "gears") are used to slow down the output speed of the engine and increase torque. However, the highest gears may be "overdrive" types that increase the output speed. The need for a transmission in an automobile is a consequence of the characteristics of the internal combustion engine. Engines typically operate over a range of 600 to about 7000 revolutions per minute (though this varies, and is typically less for diesel engines), while the car's wheels rotate between 0 rpm and around 1800 rpm. Furthermore, the engine provides its highest torque outputs approximately in the middle of its range, while often the greatest torque is required when the vehicle is moving from rest or traveling slowly. Therefore, a system that transforms the engine's output so that it can supply high torque at low speeds, but also operate at highway speeds with the motor still operating within its limits, is required. Transmissions perform this transformation. The mainshaft extends outside the case in both directions: the input shaft towards the engine, and the output shaft towards the rear axle (on rear wheel drive cars- front wheel drives generally have the engine and transmission mounted transversely, the differential being part of the transmission assembly.) The shaft is suspended by the main bearings, and is split towards the input end. At the point of the split, a pilot bearing holds the shafts together. The gears and clutches ride on the mainshaft, the gears being free to turn relative to the mainshaft except when engaged by the clutches. Types of automobile transmissions include manual, automatic or semi-automatic transmission. and the now common constant-mesh gearboxes which can include non-synchronised, or synchronized / synchromesh systems, where diagonal cut helical (and sometimes double-helical) gear sets are constantly "meshed" together, and a dog clutch is used for changing gears. On synchromesh boxes, friction cones or "synchro-rings" are used in addition to the dog clutch. The former type is commonly found in many forms of racing cars, older heavy-duty trucks, and some agricultural equipment. Manual transmissions are the most common type outside of North America and Australia. They are cheaper, lighter, usually give better performance, and fuel efficiency (although the latest sophisticated automatic transmissions may yield results slightly better than the ones yielded by manual transmissions). It is customary for new drivers to learn, and be tested, on a car with a manual gear change. In Malaysia , Denmark and Poland all cars used for testing (and because of that, virtually all those used for instruction as well) have a manual transmission. In Japan , the Philippines , Germany , Italy , Israel , the Netherlands , Belgium , New Zealand , Austria , the UK , Ireland, Sweden , Estonia , France , Spain , Switzerland , the Australian state of Victoria , Finland and Lithuania , a test pass using an automatic car does not entitle the driver to use a manual car on the public road; a test with a manual car is required. Manual transmissions are much more common than automatic transmissions in Asia, Africa, South America and Europe. There are commercial applications engineered with designs taking into account that the gear shifting will be done by an experienced operator. They are a manual transmission, but are known as non-synchronized transmissions. Dependent on country of operation, many local, regional, and national laws govern the operation of these types of vehicles (see Commercial Driver's License). This class may include commercial, military, agricultural, or engineering vehicles. Some of these may use combinations of types for multi-purpose functions. An example would be a PTO, or power-take-off gear. The non-synchronous transmission type requires an understanding of gear range, torque, engine power, and multi-functional clutch and shifter functions. Also see Double-clutching, and Clutch-brake sections of the main article at non-synchronous transmissions. Most modern North American, Japanese and many larger, high specification German cars have an automatic transmission that will select an appropriate gear ratio without any operator intervention. They primarily use hydraulics to select gears, depending on pressure exerted by fluid within the transmission assembly. Rather than using a clutch to engage the transmission, a fluid flywheel, or torque converter is placed in between the engine and transmission. It is possible for the driver to control the number of gears in use or select reverse, though precise control of which gear is in use may or may not be possible. Automatic transmissions are easy to use. In the past, automatic transmissions of this type have had a number of problems; they were complex and expensive, sometimes had reliability problems (which sometimes caused more expenses in repair), have often been less fuel-efficient than their manual counterparts (due to "slippage" in the torque converter), and their shift time was slower than a manual making them uncompetitive for racing. With the advancement of modern automatic transmissions this has changed. Attempts to improve the fuel efficiency of automatic transmissions include the use of torque converters which lock up beyond a certain speed, or in the higher gear ratios, eliminating power loss, and overdrive gears which automatically actuate above certain speeds; in older transmissions both technologies could sometimes become intrusive, when conditions are such that they repeatedly cut in and out as speed and such load factors as grade or wind vary slightly. Current computerized transmissions possess very complex programming to both maximize fuel efficiency and eliminate any intrusiveness. For certain applications, the slippage inherent in automatic transmissions can be advantageous; for instance, in drag racing, the automatic transmission allows the car to be stopped with the engine at a high rpm (the "stall speed") to allow for a very quick launch when the brakes are released; in fact, a common modification is to increase the stall speed of the transmission. This is even more advantageous for turbocharged engines, where the turbocharger needs to be kept spinning at high rpm by a large flow of exhaust in order to keep the boost pressure up and eliminate the turbo lag that occurs when the engine is idling and the throttle is suddenly opened. The creation of computer control also allowed for a sort of cross-breed transmission where the car handles manipulation of the clutch automatically, but the driver can still select the gear manually if desired. This is sometimes called a "clutchless manual," or "automated manual" transmission. Many of these transmissions allow the driver to give full control to the computer. They are generally designed using manual transmission "internals", and when used in passenger cars, have synchromesh operated helical constant mesh gear sets. Specific type of this transmission includes: Easytronic, and Geartronic. A "dual-clutch" transmission uses two sets of internals which are alternately used, each with its own clutch, so that only the clutches are used during the actual "gearchange". Specific type of this transmission includes: Direct-Shift Gearbox. Bicycles usually have a system for selecting different gear ratios. There are two main types: derailleur gears and hub gears. 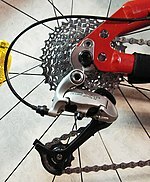 The derailleur type is the most common, and the most visible, using sprocket gears. Typically there are several gears available on the rear sprocket assembly, attached to the rear wheel. A few more sprockets are usually added to the front assembly as well. Multiplying the number of sprocket gears in front by the number to the rear gives the number of gear ratios, often called "speeds". The Continuously Variable Transmission (CVT) is a transmission in which the ratio of the rotational speeds of two shafts, as the input shaft and output shaft of a vehicle or other machine, can be varied continuously within a given range, providing an infinite number of possible ratios. The continuously variable transmission (CVT) should not be confused with the Infinitely Variable Transmission (IVT) (See below). The other mechanical transmissions described above only allow a few different gear ratios to be selected, but this type of transmission essentially has an infinite number of ratios available within a finite range. The continuously variable transmission allows the relationship between the speed of the engine and the speed of the wheels to be selected within a continuous range. This can provide even better fuel economy if the engine is constantly running at a single speed. The transmission is in theory capable of a better user experience, without the rise and fall in speed of an engine, and the jerk felt when changing gears. Most (if not all) IVT's result from the combination of a CVT with an epicyclic gear system (which is also known as a planetary gear system) that facilitates the subtraction of one speed from another speed within the set of input and planetary gear rotations. This subtraction only needs to result in a continuous range of values that includes a zero output; the maximum output/input ratio can be arbitrarily chosen from infinite practical possibilities through selection of extraneous input or output gear, pulley or sprocket sizes without affecting the zero output or the continuity of the whole system. Importantly, the IVT is distinguished as being 'infinite' in its ratio of high gear to low gear within its range; high gear is infinite times higher than low gear. The IVT is always engaged, even during its zero output adjustment. The term 'infinitely variable transmission' does not imply reverse direction, disengagement, automatic operation, or any other quality except ratio selectability within a continuous range of input/output ratios from a defined minimum to an undefined, 'infinite' maximum. This means continuous range from a defined output/input to zero output/input ratio. The Electric Variable Transmission(EVT) is a transmission that achieves CVT action and in addition can use separate power inputs to produce one output. An EVT usually is executed in design with an epicyclic differential gear system (which is also known as a planetary gear system). The epicyclic differential gearing performs a "power-split" function, directly connecting a portion of the mechanical power directly through the transmission and splitting off a portion for subsequent conversion to electrical power via a motor/generator. Hence, the EVT is called a Power Split Transmission (PST) by some. The directly connected portion of the power travelling through the EVT is referred to as the "mechanical path". The remaining power travels down the EVT's "electrical path". That power may be recombined at the output of the transmission or stored for later, more opportune use via a second motor/generator (and energy storage device) connected to the transmission output. The pair of motor/generators forms an Electric Transmission in its own right, but at a lower capacity, than the EVT it is contained within. Generally the Electric Transmission capacity within the EVT is a quarter to a half of the capacity of the EVT. Good reasons to use an EVT instead of an equivalently-sized Electrical transmission is that the mechanical path of the EVT is more compact and efficient than the electrical path. The EVT is the essential method for transmitting power in some hybrid vehicles, enabling an Internal Combustion Engine (ICE) to be used in conjunction with motor/generators for vehicle propulsion, and having the ability to control the portion of the mechanical power used directly for propelling the vehicle and the portion of mechanical power that is converted to electric power and recombined to drive the vehicle. The EVT and power sources are controlled to provide a balance between the power sources that increases vehicle fuel economy while providing advantageous performance when needed. The EVT may also be used to provide electrically generated power to charge large storage batteries for subsequent electric motor propulsion as needed, or to convert vehicle kinetic energy to electricity through 'regenerative braking' during deceleration. Various configurations of power generation, usage and balance can be implemented with a EVT, enabling great flexibility in propelling hybrid vehicles. The Toyota single mode hybrid and General Motor 2 Mode hybrid are production systems that use EVTs. The Toyota system is in the Prius, Highlander, and Lexus RX400h and GS450h models. The GM system is the Allison Bus hybrid powertrains and are in the Tahoe and Yukon models. The Toyota system uses one power-split epicyclic differential gearing system over all driving conditions and is sized with an electrical path rated at approximately half the capacity of the EVT. The GM system uses two different EVT ranges: one designed for lower speeds with greater mechanical advantage, and one designed for higher speeds, and the electrical path is rated at approximately a quarter of the capacity of the EVT. Other arrangements are possible and applications of EVT's are growing rapidly in number and variety. EVT's are capable of continuously modulating output/input speed ratios like mechanical CVT's, but offer the distinct difference and benefit of being able to also apportion power from two different sources to one output. Hydrostatic transmissions transmit all power hydraulically, using the components of hydraulic machinery. There is no solid coupling of the input and output. One half of the transmission is a hydraulic pump and the other half is a hydraulic motor, or hydraulic cylinder. Hydrostatic drive systems are used on excavators, lawn tractors, forklifts, winch drive systems, heavy lift equipment, agricultural machinery, etc. Hydraulic drive systems can be used as an extra transmission between motor and f.i. wheels. If the hydraulic pump and/or hydraulic motor are not hydrostatic, but hydrodynamic, then the transmission can be called hydrodynamic. The pump and motor can consist of rotating vanes without seals. The pump and motor can be placed in reasonable proximity. The transmission ratio can be made to vary by means of additional rotating vanes, an effect similar to varying the pitch of an airplane propeller. The torque converter in most American cars is a hydrodynamic transmission, placed ahead of the automatic transmission. It was possible to drive the Dynaflow transmission without shifting the mechanical gears. Hydrodynamic transmissions tend to be inefficient due to energy losses in the fluid. Electric transmissions convert the mechanical power of the engine(s) to electricity with electric generators and convert it back to mechanical power with electric motors. Electrical or electronic adjustable-speed drive control systems are used to control the speed and torque of the motors. If the generators are driven by turbines, such arrangements are called turbo-electric. Likewise installations powered by diesel-engines are called diesel-electric. Diesel-electric arrangements are used on many railway locomotives, ships and large mining trucks. Virtual Transmission allows for the same traction motor to be both a low-speed high torque and high-speed electric motor, using the winding/software that runs on the new electric motors. This virtual transmission will require less complex engineering, and less weight. The alternator and starter for the Volt can be combined into a single armature, smaller and lighter than each alternator and starter individually. Graduated Licensing: Is it what it's meant to be?